Interact with the applet below for a few minutes. 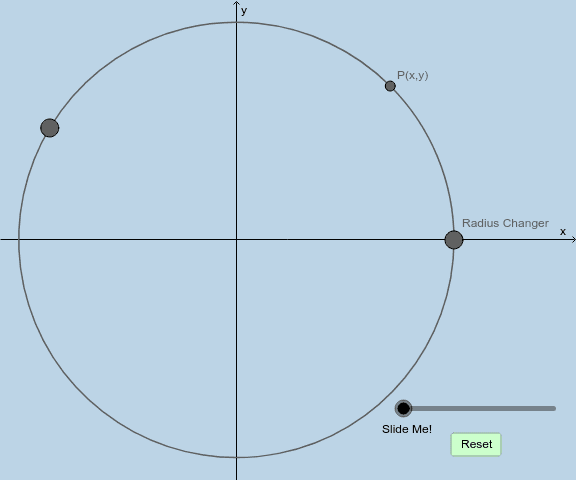 Use your observations from this applet to help you complete the Evaluating Trigonometric Functions of Special Angles packet. You may first want to reflect upon the answers to the questions listed below this applet to help you complete this packet. Just by merely observing the dynamics of this applet, what would the tangent of 45 degrees be? What would the cotangent of 45 degrees be? Do the values of either of these ratios depend upon the length of the circle's radius? Explain why or why not.